London - The International Paralympic Committee (IPC) on Wednesday said that there was no substance to allegations from sprint star Oscar Pistorius about the length of his rivals' artificial running blades. "There is no evidence that any athlete competed on different size running blades," IPC media and communications director Craig Spence told a news conference in London. "Unless the South Africans can come to us with some evidence that proves otherwise, it's something that we won't continue investigating." 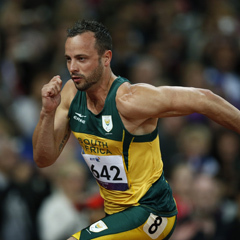 Spence said that South Africa had made a formal complaint raising Pistorius's claims he was at a disadvantage in the T44 200m final because other runners were "a lot taller" and he could not compete with their stride length. Pistorius's defeat to Brazil's Alan Oliveira was his first defeat in a 200m in nine years and means he will now not retain the three sprint titles he won in Beijing. The 25-year-old - the most high-profile athlete at the Games after he became the first double-amputee to compete at the Olympics last month - said he had raised the issue with the IPC but it had fallen "on deaf ears". He later apologised for the timing of the comments but not the substance. Spence said they had spoken to national team coaches and found no evidence to back up the claims. "When we put (the South African) allegation to the coaches there was a look of shock to be honest because running on different size prostheses or swapping them for races is extremely difficult to do for an athlete," he added. Swapping blades mid-competition is currently against the rules. Spence said that Games organisers contacted all national Paralympic committees in April this year and asked them to highlight any concerns about the rules but no issues were raised by South Africa. The IPC has said that all athletes' prostheses, which have to be in proportion to the length of their body, were measured on Sunday and no infringements were found.